My mother was a great frequenter of Jumble Sales, Car Boot Sales and Charity Shops over the years, and would regularly come home with some great finds. I remember when I she found this plaid brooch for me in one of the regular Jumble Sales held in the Kingussie Church Hall, in the early 1990s. I was never too sure what it actually was. It’s not like a regular piper’s plaid brooch with a Cairngorm Stone in the middle. Nor does it have any obvious regimental insignia to be found on similar items from the Seaforths, Camerons, Gordons or the Black Watch. It’s also a couple of centimetres smaller in diameter than most plaid brooches you see. Now fast-forward circa 25 years, from the early 90s to last week. 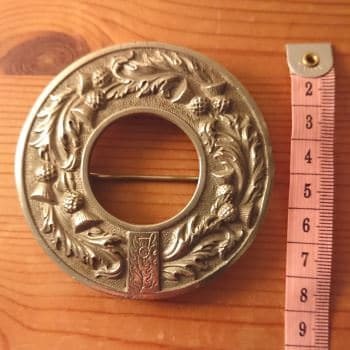 I was doing my regular internet search for piping uniform accessories, and I saw the exact same brooch posted here on Pinterest by a Scottish militaria expert whom I know, detailing it as a Piper’s Plaid Brooch of the Inverness-shire Militia from circa 1850. The Inverness-shire Militia were formed in 1802 and served on garrison in a number of places around the UK, and also supplied men to regiments fighting in the Crimean War. They were re-designated in 1876 as the 76th (Highland Light Infantry) Militia, and in 1881 became the 2nd Battalion of the Queens Own Cameron Highlanders. Given that the Militia became a battalion of the Camerons in 1881, no brooches would have been produced since then due to the pipers being supplied with Cameron Highlanders uniform. I think that must put my mother’s “Jumble Sale Gem” at a very minimum of 137 years old! I’m still wearing this brooch on my feather bonnet with a Cameron Highlanders collar dog fixed in the middle (more on the feather bonnet in my Uniform Tour).